My second image for Redux Month, redoing the Frost Giant. This is a case of me liking the design, but not liking so much how the image itself was acually made. I found the image a bit cramped, to its detriment. So I've still kept the whole vaguely arctic circle thing to it. 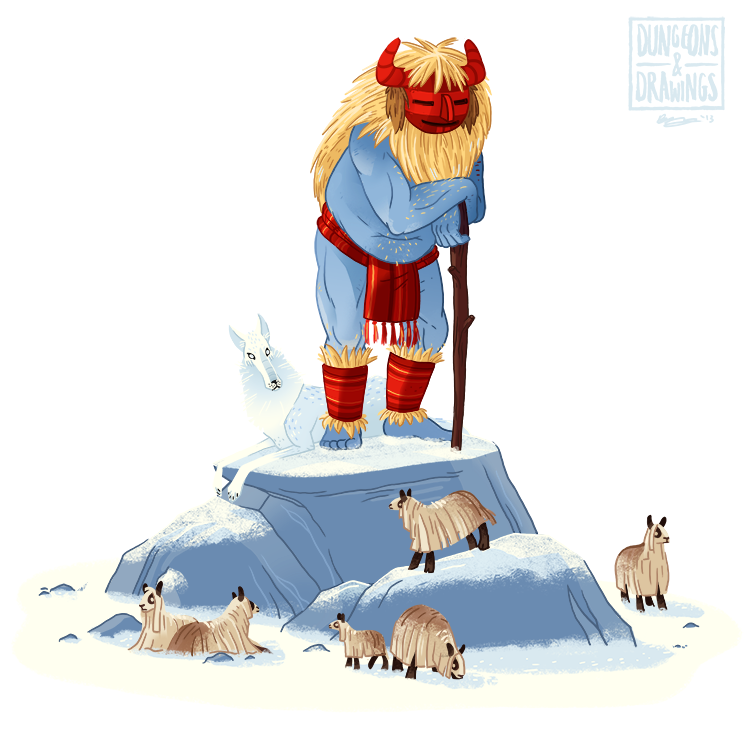 I like to think this particular Frost Giant retired after a few battles, then he and his favourite winter wolf buddy decided to retire to a comparatively peaceful life on sheep herding. I know in a lot of fantasy games and some fantasy lit, giants are usually pretty dumb brutes. But in quite a few fairy tales and such, giants tend to own and manage large portions of land. In Cornish stories, they have castles and rich tin mines. Adventurers usually find a way to take this from them. Puss in Boots steals a kingdom from a giant, which includes vast farmlands being kept by various farmers. This goes as far back as the Odyssey (probably even further back), where Odysseus comes across an islands of cyclopes, where they keep great herds of goats and sheep. Odysseus and his crew (the ones that haven't been eaten by Polyphemus), manage to escape by clinging to the underside of the sheep. Lovely winter wolf in particular. Too cool! I like it, excellent work . . . as always.